In a large bowl, beat heavy cream until stiff peaks form. Add cream cheese, sugar and cinnamon. Whip until smooth. Transfer mixture to a piping bag. 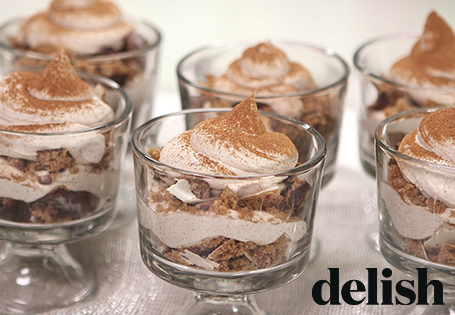 Fill 6 small cups with a layer of gingerbread crumbles, then a layer of cream mixture. Repeat the layers. Garnish with remaining gingerbread and cinnamon.